We specialize in short to medium production metal stamping. In addition to our complete In-House Tool Room, we can provide prototypes and complete assembly. 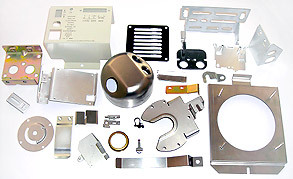 Our capabilities/services include: Finishing, CNC Machining, Forming, Spot Welding, Pem Assembly, Drilling, Tapping, Punching, Staking, Riveting, Reaming & Countersinking. We are committed to the old fashioned idea of providing a Superior product with Superior Service. Be sure to check out our Parts Gallery for a look at some of the quality products we've produced and contact us today for an immediate quote on your next project.